Posted by Rutger on 2015/10/05 . Leave a comment. The exhibition EVA (http://www.evabonniersdonationsnamnd.se/en/projekten) opens on Thursday 8th of October at the Royal Institute of Art (Fredsgatan 12), Stockholm. In the Spring of 2015, Svensk Standard’s entry Bygglovsboken was selected as one of ten proposals which were subsequently funded and developed in order to form part of the exhibition EVA, an open public art and architecture competition run by Eva Bonniers donationsnämnd. 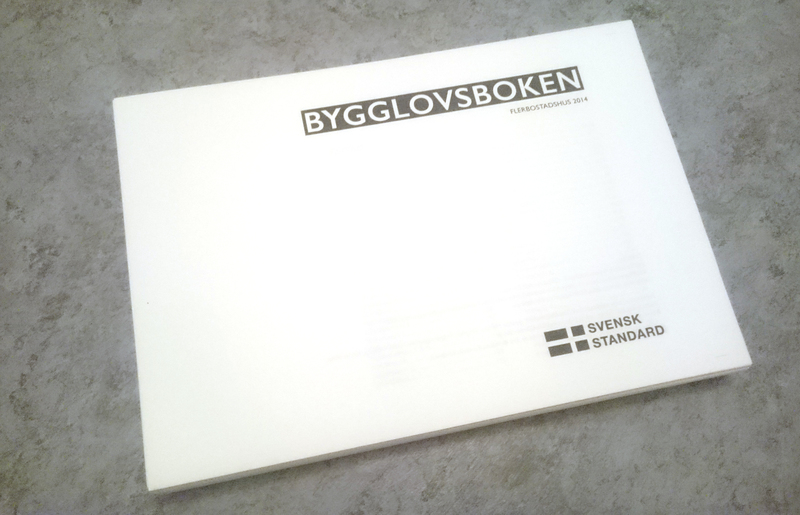 In response to the competition brief, Svensk Standard proposed to produce an almanac of building permit applications (bygglov), cataloguing plans and sections for all proposed multi-residential developments granted a permit within the City of Stockholm in 2014. Through the book, we wish to raise the value of existing regulatory structures as a space of democratic negotiation, and the planning process form of public space in their own right. We also see the book as providing a “neutral” evidence base for a discussion of contemporary architecture. Specifically, we ask: What can be said about the housing we are designing, regulating and building at the present moment? What forms of publicness and of society is Swedish architecture (re)producing through its design labor in the housing sector? What are the possibilities for architectural critique within a climate of neoliberal deregulation? Bygglovsboken is an un-curated catalogue of un-doctored floor plans and sections, from the 51 multi-residential developments that were granted a building permit within the City of Stockholm last year (2014). Unfiltered raw data, cross-sectional exposé, and neutral evidence base, this book provides a comprehensive glimpse into the residential architecture of the very near future, inviting the question: what do we think about that future? The content of the book reflects the hard work of many architects, planners, administration staff, financiers and venture capitalists, marketing kids, project managers, engineers, curators, citizens, and politicians, whose collective desire to produce (or prevent) architecture’s materialization in the real. These actors are all brought together in the public space of the building permit application process.